Nautilus Inc is the parent fitness company of five popular exercise machine brands: Bowflex, Nautilus, Schwinn, Universal, and Octane Fitness. The company manufactures and distributes exercise machines of all types, ranging from bikes, to treadmills, to Bowflex machines, to everything in between. The company has is located in Vancouver, Washington and has been traded publicly since 1999. Last updated 10/1: fixed broken links..
Nautilus Inc was founded in 1986. The Nautilus machine, called the Blue Monster at the time, was created as an exercise machine that would “work more efficiently with human movement”. After its success, the company expanded until they were eventually bought out by Bowflex. 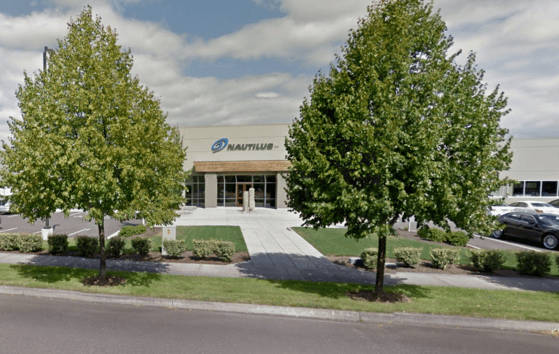 The name of the company changed a few times before coming full-circle back to Nautilus Inc.
Nautilus Inc markets through a wide variety of advertising channels. You have almost certainly seen Bowflex machines advertised in infomercials. You may have seen their other companies advertised through traditional media, too. Nautilus Inc also commands a strong retail presence to sell its machines, and they have been known for their nationwide telemarketing campaigns as well. Bowflex is Nautilus Inc’s most popular product line. Included is the Max Trainer line, as well as others like adjustable ergonomic dumbbells. Overall, though, the Bowflex Max Trainer is the most popular machine made by Nautilus Inc. View our reviews for the M3, M5, and M7, or see a breakdown of each version here. The Bowflex TreadClimber is another popular machine in the Bowflex product line. Nautilus is a more general product line that you will frequently see in expensive commercial gyms. From treadmills, to bikes, to everything in between, Nautilus offers exceptionally high-quality machines. The company got their start by offering circuit training machines, but after that fad passed, they moved to more mainstream offerings and have been very successful in doing so. Schwinn is one of the oldest names in at-home fitness. Starting in 1965, Schwinn began offering machines like rowing machines and bikes that were affordable to the homeowner. They haven’t stopped, and a large portion of Nautilus Inc’s home products are sold under the Schwinn name. Universal is synonymous with strength. Universal started in Muscle Beach, CA, and their machines are made for athletes and fitness junkies who need the best possible equipment to execute their daily workouts. Octane Fitness is similar to Bowflex, but newer. The machines are geared towards comprehensive weight loss in one motion, but they look different from Bowflex machines and activate different muscles. Nautilus Inc is widely respected for their exercise machines. Unlike other companies, Nautilus Inc does not cut corners to save money. If you are using a shaky treadmill in the gym, or a weight machine that always seems to break, chances are, it’s not made by Nautilus Inc.
Nautilus Inc. makes the best machines, and they do not compromise on material quality or price to do that. So, you won’t find a $200 workout machine from Nautilus Inc – but you will find cheaper offerings, and every single one is guaranteed to be perfect. Just make sure you read reviews before buying any particular model of any particular Nautilus Inc machine – though they are all good, they are still different, and certain ones will appeal more to certain people than others. For example, the Max Trainer M3 is a core model at just under $1,000, and the M5 and M7 are improved versions for a higher price tag. Customer support from Nautilus Inc is known to be some of the most helpful in the fitness industry. The level of customer support you receive will vary across each brand – for example, Bowflex is better than Schwinn. But, you will always be speaking with a friendly representative, and that representative is always speaking perfect English. Nautilus Inc is very generous on warranties, refunds, and shipping as well, which adds to their service rating. Most machines come with a hefty 2-year warranty with free shipping and unconditional refunds. Make sure you buy from the official site (and not a third party) if you want all of these perks in your purchase price. Overall, Nautilus Inc is an established fitness machine brand with a little something for everyone. If you are considering purchasing a machine made by a Nautilus Inc brand, you are making a good choice. Check out the full history of Nautilus from 1986 to now. Learn more about each brand and the product you are considering buying. We recommend going to the official site before you buy to make sure you are getting the right machine. If you are considering the Bowflex Max Trainer, read our reviews for each different model.